Happy Wars is a multiplayer experience unlike any other. Players can assume one of three roles – warrior, mage, or cleric – and take on their enemies in a variety of over-the-top battlefields, from grasslands to lava fields and the ocean floor. Whether joining in battles involving up to 30 players online or tackling an extensive single-player campaign, players secure victory by occupying towers, attacking the enemy castle, and generally wreaking havoc using the 27 unique skills in the game. To see Happy Wars in action, check out the debut trailer online here. Happy Wars is coming to the Xbox LIVE® Arcade on the Xbox 360® video game and entertainment system from Microsoft Studios. 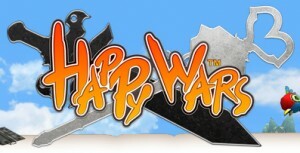 For more information, visit the official website at http://www.happywars.net/. For Happy Wars E3 2012 screenshots, click here. Blending the playfulness of toys with computer logic-based leading edge technology, Toylogic was born in the spirit of creating enjoyment, surprise, and impact through high-tech entertainment. Founded in Tokyo in 2006, Toylogic develops console game titles that evoke the spirit of the company’s ideals.